A woman took to great heights and named her newborn Jet Star. Would you name your baby after where they’re born? We can only imagine the fantastic time this kid is going to have when he starts going to school. Children can be mean, I’ve had my fair share of name calling and name twisting. So I feel for this fella. The mother gave birth on a flight from Singapore to Yangon last Friday (April 22) and naturally decided to name her son after the airline to show her appreciation for the care she received. Jetstar Asia flight 3K583 had just landed in Yangon, when the mother, a Myanmar national, unexpectedly went into labour, said a Jetstar Asia spokesperson. With the help of the crew on board, as well as three doctors who happened to be on the plane, baby Jet Star, who weighs around 2.9kg, was safely delivered. Kudos to Jetstar for going above and beyond to ensure that both mother and child were safe. There are many ways to thank the airline and to show your gratitude, this perhaps is a little over the top. But hey, to each their own. And in all honesty it’s a fabulous piece of news. 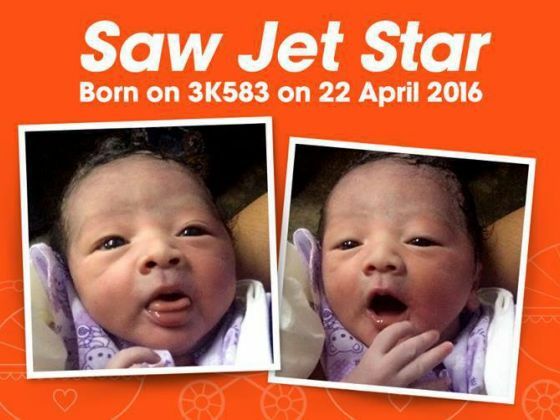 Congratulations to the mother, baby Jet Star and Jetstar Asia. » New fathers will have more reason to rejoice!